ULLUCO (ullucus tuberosus) is a perennial plant, but grown as an annual in our temperate regions. 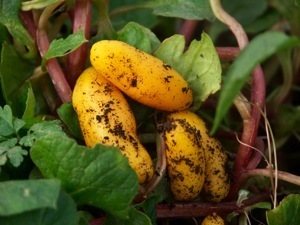 The plants are almost exclusively propagated by tubers, a bit comparable to potato growing. Tubers are started off in small pots in the greenhouse or on a windowsill, make sure they have plenty of light and water. Plant the tubers some 2-5 cm deep, depending on tuber size (bigger tubers can be deeper planted).The best time to start them is end of March , until even end of April. They are damaged by frosts, even though some reports mention they stand up to -5 degrees Celsius. This is not my experience, so take care ! The plants prefer a moderate heat, they don’t stand really warm (and dry) conditions. 15-25 ° seems to suit them best! Outside planting can be done from mid-May, whenever the risk of frosts is gone. They don’t grow big, space them 20-30 cms. in good garden soil. Height is at the most 30 cms., the plants can be earthed up a little bit, the way potatoes are earthed up (don’t exaggerate though). Ulluco will grow steadily throughout the summer, tubers only begin forming from the end of September, when days are shorter than 12 hours. From then on, you will probably spot tiny stems forming in the axils of the leaves. These stems will be heading directly to the soil. 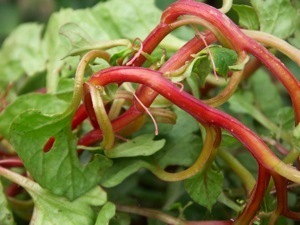 When they reach and penetrate the soil, tubers will be formed at the end of the stems. Be careful, the stems and attachment points are very brittle. Sometimes I earth up these newly forming tubers, this is not necessary, but if the tubers are exposed to light, they will turn green (some varieties are green anyway). This is purely esthetical, I have never read a report that these green tubers contain toxic elements (the Ullucus is not a member of the solanaceae family, to which potatoes belong, and therefore contains no solanines). 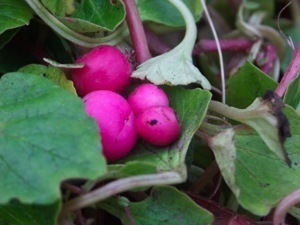 Try to keep the plants frost-free, tubers only reach their full size in November or even December. Some alternative methods can be used, I prefer growing them in big tubs, and moving them into the greenhouse whenever the temperatures go down. They are really comfortable in tubs, though the harvest will likely be a bit smaller. Water them regularly, as pots can dry out quickly in warm weather. Another advantage of this method is whenever the summer is really hot, you can easily move them to a more shady spot. Don’t expect really a really big harvest in our climate, tubers are at the most 8cms long, you will get many small tubers and a few larger ones. 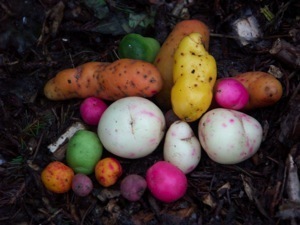 A 1 kgs harvest from one plant is really very very good; if you have such a result, try and re-grow the best looking tubers from such a big-crop plant, that way you will be selecting on on these bigger –crop qualities.